Prof Etienne Barnard, a research professor at the North-West University’s (NWU’s) research niche area Multilingual Speech Technologies (MuST), recently travelled to the United States for a research visit to the Indiana University Bloomington. Prof Barnard pointed out that the successes achieved with these algorithms in recent years are based on their unprecedented ability to generalise on unseen data. This property of DNNs is somewhat mysterious, since it occurs in models with many more parameters than conventional machine-learning theories would recommend. Prof Barnard reviewed the empirical evidence for their performance, and discussed various approaches towards a relevant theoretical description. “These approaches, which include the controversial ‘no free lunch theorem’, do not explain the performance of DNNs, but provide some potentially useful insights,” he said. He ended his talk with speculations on a more satisfactory basis for understanding generalisation. The talk was attended by both the academic staff and the students of the university. It was well received and sparked a lively discussion after the session. 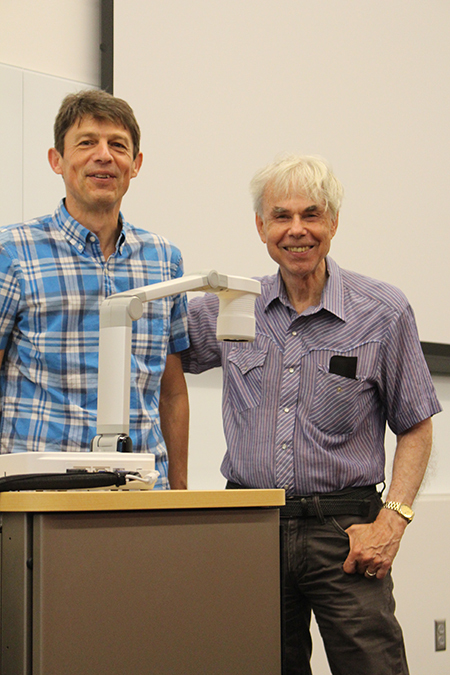 During his visit, Prof Barnard also had the opportunity to meet one of his lifelong heroes, Prof Douglas Hofstadter, the author of several acclaimed books on consciousness, thinking and creativity, and one of the key figures in the development of the cognitive sciences. Prof Etienne Barnard and his lifelong hero, Prof Douglas Hofstadter.